Paypal is by far the most recognized E-wallet in the world and probably the most popular form of payment among binary options traders wanting to deposit money and fund their trading account. So it comes as no surprise that many scam brokers like Empire Options claim they offer this funding methods to attract traders, however in reality they offer the standard credit card solution such as Visa, Amex, and Mastercard. Why is Paypal Not Being Offered By Most Brokers? Primarily it has to do with regulation and legal interpretations which create technical constraints. Paypal is a stickler when it comes to legalities, so until the SEC or any other regulatory body makes an official statement concerning binaries, you will not see this payment method integrated into your cashier. Binary Scam Alerts has recently gathered all the possible scam tactics brokers have been using, this makes a very interesting read for anyone wanting to invest. About 2 years ago Empire Option announced that its was accepting Paypal. Some blogs and portals actually still falsely advertise this for a variety of reasons, but primarily because this hasn’t been checked. In reality Empire Option are a scam broker that will only take your deposits and never allow you to cash out your winnings. They have employed this dirty tactic to gain customers under false pretenses and hopefully convince them to purchase using their credit cards. Optimarkets made a smart decision 10 months ago and rose to the challenge when traders from the USA were able to fund their accounts with the world’s most popular E-wallet. However, Paypal legal counsel was hesitant about releasing funds since it views binary options as high risk and a form of gambling or financial betting, as opposed to investing. This caused Optimarkets management to cease working with them and change their payments policies. Goptions has recently declared that they also accept this form of funding, however I have been getting mixed responses on my blog with traders saying its just a ploy to get them to register, while others say they were able to deposit with Paypal. I asked Goptions manager Danny Stevens about this, and he reiterated that they are fully compatible with PP, however it’s clear to me that this solution is not completely integrated and that there may be some issues when trying to deposit. 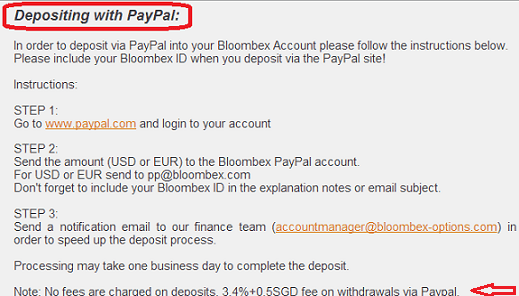 Most recently Bloombex Options have stated that they are good to go with PP deposits and withdrawals. In fact, they have even stated this clearly in their banking section (see below) and explain how to proceed with the transaction. I have not heard any complaints about malfunctions or scam tactics, so for the time being they look like the genuine article and are highly recommended. Additionally, if you are looking for a Neteller solution Brokerage Capital is an excellent option for you. The Paypal User Agreement explains exactly what services you qualify for, but it does not get into the regulatory aspects of what type of services are considered to be high risk. For example, if you are a trader from the UK and want to invest in Forex.com for example, you should have no problem since its fully regulated. CySec or the Cyprus Securities Exchange is currently considered to be the leading licensing authority these days for binary options platforms, however if the SEC does not provide its seal of approval US traders will not be able to trade with a regulated broker. Which leaves them with NADEX and the CBOE, but they are based on a spread format as opposed to a market maker format which includes bonuses and incentives. Other licensing bodies include the FSA, AFSA, and FCAC which are starting to become a lot more active in their statements and policies towards rogue brokers.